Chris Peterson (b. 1975) grew up in the foothills of the Wasatch Mountains. The oldest of seven children, Chris played musical instruments throughout his childhood. In high school, he spent a lot of time exploring the local backcountry and discovered a passion for drawing and painting as well. After high school and a Mormon mission to the South Bronx, Chris returned to Utah and began working at Sundance Resort in Provo Canyon. Back in his home range, and bolstered by a creative community, Chris’ twenties were a prolific period of painting. Backpacking and flyfishing trips across the American West inspired his work, and painting studies at BYU and Kansas City Art Institute refined his method. During this period, Chris exhibited across the U.S.- living and painting in Utah, New York City and Kansas City. In 2001, Chris shifted to pursue a career working in conservation and community-building organizations. This work included Colorado River restoration, rural development programs in Africa and Asia, and directing arts programs and a community center for Salt Lake City. Graduate studies at the University of Utah during this time earned Chris an M.P.A. in Nonprofits & Environmental Policy and an M.A. in Environmental Humanities. Chris taught elementary art (K-6) in 2009, which inspired him to begin moonlighting on murals and organizing community arts projects. 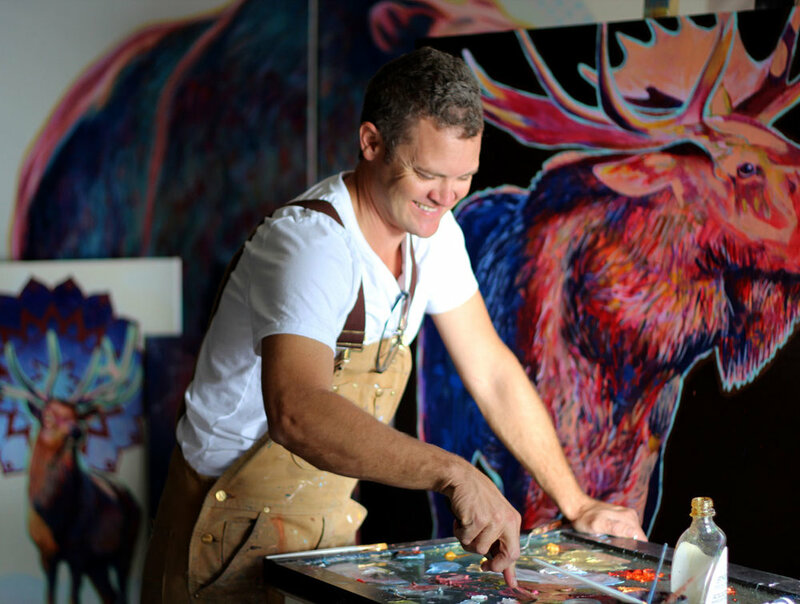 In 2017, a series of wildlife murals led him back into the studio to work on a series of paintings about the spiritual nature of wildlife. Chris paints and lives in Salt Lake City, Utah with his wife Lisa and four daughters.